PVCI Verification IP provides an smart way to verify the PVCI component of a SOC or a ASIC. The SmartDV's PVCI Verification IP is fully compliant with standard PVCI Specification and provides the following features. 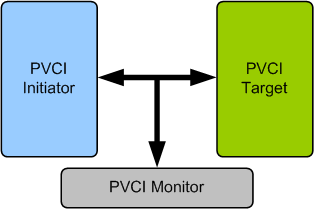 Supports PVCI Initiator, PVCI Target, PVCI Monitor and PVCI Checker. Supports all PVCI data and address widths. Supports 8-bit, 16-bit and 32-bit devices. Supports 8-bit, 16-bit and 32-bit transfers. Simple packet and burst transfer support. Target supports fine grain control of response per address or per transfer. Programmable wait state and timeout insertion. Ability to inject errors during transfers. Configurable PVCI interface size for read and write transfers. Rich set of configuration parameters to control PVCI functionality. PVCI Verification IP comes with complete testsuite to test every feature of PVCI specification. Faster testbench development and more complete verification of PVCI designs. Easy to use command interface simplifies testbench control and configuration of Initiator and Target. SmartDV's PVCI Verification env contains following. Complete regression suite containing all the PVCI testcases.